DC Deck Building Game: Confrontations is a standalone game as well as an expansion for the DC Deck Building Game by Matt Hyra and Nathaniel Yamaguchi, published by Crytozoic Entertainment. It is for 2-4 players. This expansion adds 4 hero and 4 villain characters to play as, as well as new main deck cards and new enhanced strength cards. It also has new artwork and designs for starting cards and weaknesses. 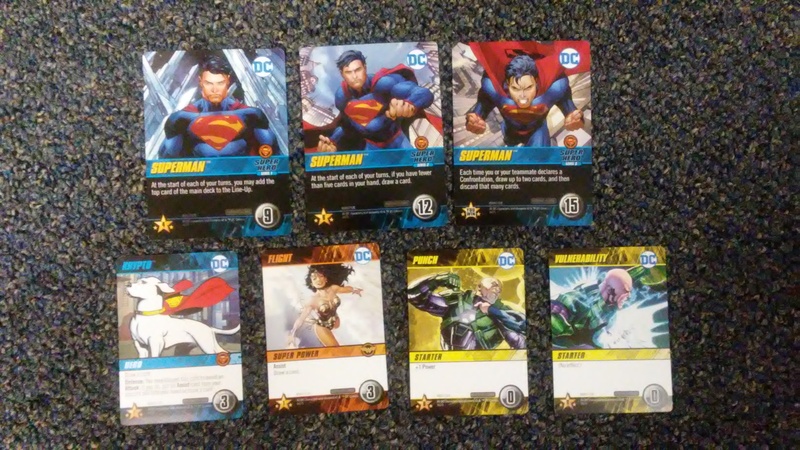 For more information on the DC Deck Building game and how to play it, as well as all the different sets that this product can be used with, please check out the link at the bottom of the review. Setting up and playing this game is a little different than either the DC Comics Deck Building Game or the expansion/standalone product Rivals- Batman vs The Joker. Although there are some familiar aspects in the latter of the two. With that in mind, I’ll give you a brief explanation of how to set up and play this version. Before I start though, let me mention that this review will mainly cover the 4 player rules. There are variant rules for playing with 2 or 3 players that I will briefly touch on in the gameplay section below. All that said, let’s begin. To begin, players choose a teammate and then choose a character to play. It should be noted that partners should sit beside each other so that they can compare their cards and discuss strategies. Each player will then place their 3 oversized character cards on top of each other with the 9 on top, the 12 in the middle and the 15 on the bottom. Each player then takes 7 Punches and 3 Vulnerability cards to create their starting deck. The Main Deck is shuffled together and placed face down in the middle of the play area. The top 5 cards of the deck are then placed side by side in a row beside the Main Deck called the Line Up . The Enhanced Strength and Weakness cards are placed in separate stacks at the end of the Line Up. The first player is chosen. That player will then take the number 1 token. Their opponent across from them will take the number 2 token. The first player’s partner takes the number 3 token and the number 4 token goes to the last player. These tokens are placed beside each player’s character card. Players shuffle their deck and draw the top 5 cards to create their starting hand. Play now begins. On a player’s turn, the player will resolve any start of turn effects. They are then able to choose to announce a Confrontation with the lowest cost opposing Character or they may simply play as many cards from their hand as they would like in order to gain Power and purchase other cards. I’ll discuss Confrontations in a bit more detail a little bit later, for now just understand that this is an option. Each time a card is played, it’s text is resolved immediately. The player will then gain Power which can be used to purchase cards from the Line Up or Enhanced Strength stack. These cards will help make the player’s deck stronger. Any bought or gained cards are placed face up in the player’s discard pile. Once a player has finished playing cards and making purchases, they will announce the end of their turn. Any remaining cards in the player’s hand are placed into their discard pile. Any end of turn effects are resolved at this time. Any cards that were played are now placed into the player’s discard pile. Any unspent Power is lost at this time. Five cards are then drawn from the player’s deck. If there aren’t enough cards to draw five, the player’s discard pile is shuffled to create a new face down deck. The remaining cards are then drawn. Play then passes to the next player in turn order. Play continues until one of the following two conditions is met. If an opponent’s last character card has been defeated, then the game ends and that player’s team wins. If there aren’t enough cards left in the Main Deck to refill all five slots in the Line Up, then the game ends. In this last case, all of the Location cards, cards in the player’s hand and discard pile are returned to the player’s deck. Each player will then total up the Victory Points on the cards in their deck. Weakness cards will subtract points from the player’s total. The team with the most combined points is the winner. Earlier I mentioned Confrontations, these are the only way that an opponent can be defeated. When a player chooses to Confront an opponent, they are not allowed to later purchase cards on their turn. The player will play cards from their hand to gain Power which they will use to try and defeat their opponent’s lowest character. The player must play all the cards that they wish to play at this time. Their teammate may also play assist cards that will help them gain Power. Once both players have finished playing cards, they must announce to their opponents that they have finished. The opponents are then allowed to play block cards in order to increase the character’s Confrontation cost. If the players are still able to have as much or more Power than the opponent’s character Confrontation cost, then they defeat that version of their opponent’s character. That card is then removed from the player’s character card stack and placed near the attacking player’s side of the table. Once a player’s last character card is defeated, that team loses. So as you can see, there’s a lot going on here, but what does this add to the base game of the DC Deck Building Game? Well for starters, there’s a really cool thick plastic card that is used as a divider making it possible to add the contents of this game to the Multiverse box. There’s also a randomizer card to be used with that game’s content and rules. There are 24 oversized character cards, 3 for each character. There are cards for Superman, Wonder Woman, Aquaman, Zatanna, Lex Luthor, Circe, Ocean Master and Felix Faust. These are very much like the cards for Batman and the Joker in the Rivals expansion. There are the new Enhanced Strength cards which take the place of the Kick cards in previous versions. There are Punch, Vulnerability and Weakness cards, all with new artwork. Finally there’s the Main Deck with cards appropriate for each of the characters. Just like previous versions, the artwork on each card is amazing. I like that there are Punch and Vulnerabilty cards with artwork for both the heroes and the villains. I’m really happy with the overall look and feel of the many different cards and types. Overall, there’s a lot to like here, especially for fans of the Rivals – Batman vs. The Joker game. Extremely well done. The rulebook for this game is very similar is style, setup and size to those in previous versions. There are lots of great pictures and examples throughout the book, including how the game should look when setup. Everything is explained really well and there’s nothing difficult to understand. All of the new card types are explained in great detail. There’s even a section for several cards that clarify how each one works. The book also has instructions for using this with Rivals. There’s also a section that explains how to play with only 2 or 3 players. Mainly this involves how the Assist cards work. The back cover has a really great reference guide with turn sequence and what happens at the end of a turn. Overall I feel like this does a good job at explaining everything and it looks good in the process. Anyone familiar with the Rivals- Batman vs The Joker expansion/standalone game for the DC Comics Deck Building Game should find lots of familiar things here. Personally, I really enjoyed playing that version. That should come as no surprise as I’ve really enjoyed the entire DC Deck Building Game collection. This is no exception. I had hoped for more characters to be able to play against each other like Batman and the Joker. I have to be honest though, I had hoped for the Flash or possibly Green Lantern instead of Zatanna and Aquaman. Look I have nothing against either of those characters, they’re both great in their own ways. I just tend to like Flash and GL better. Call it a personal preference. Still, now there are more options to choose from and a more dynamic gameplay. It’s also possible to play with more than just 2 players which I like a lot. It makes it feel more like an actual team up like those old issues of the Brave and the Bold comics. Honestly, that’s the way to play this game. I do like playing 2 players, but 4 is the real way to go. That way the Assist keyword actually comes into play and works correctly. Not that you’re not able to use them in a 2 player game, it just plays differently. Instead of your teammate helping you out, you’re placing an Assist card on your own character card to be used in a later turn. It works, but it feels a bit odd at times. The confrontations make me think of Munchkin in a way. The attacking player is playing all these cards from their hand in order to try and beat, in this case, the opponent’s character. It has a bit of that same feel but looks a lot better doing it. I think fans of the DC Deck Building Game will really enjoy this version, especially if they liked Rivals. I would definitely recommend it. In my opinion, it’s a must have expansion. 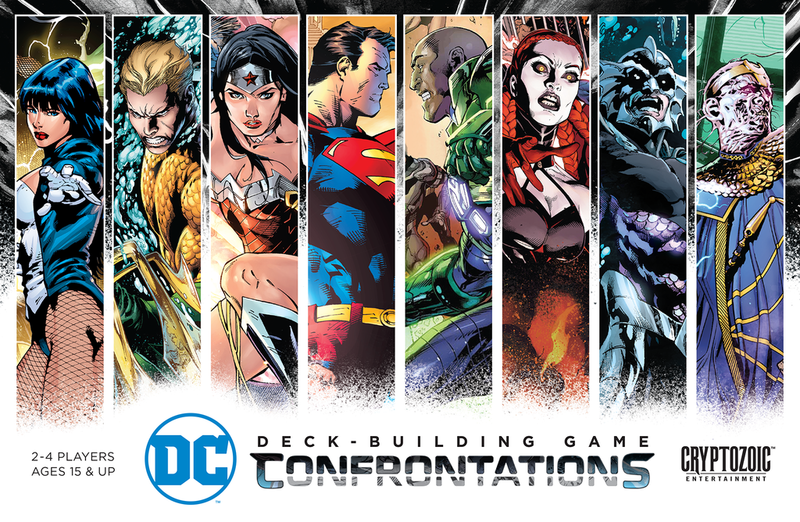 DC Deck Building Game: Confrontations is an expansion/standalone game for the DC Deck Building Game that provides a new way of playing team battles. It adds lots of new material that plays a lot like Rivals – Batman vs. the Joker, except on a larger scale. It provides the players with 8 characters to play as including Wonder Woman, Superman, Zatanna, Aquaman, Lex Luthor, Circe, Ocean Master and Felix Faust. The game doesn’t take that long to play. Most game sessions last around 30-40 minutes. The cards look amazing. I really love the artwork especially on the new character cards. There’s a lot of new artwork on the regular cards as well as lots of new locations, villains, heroes, super powers and equipment. Each new card fits in with one of the hero or villain’s worlds. The game play is a lot like Rivals except with a bit of a twist and it allows for 4 players to play in teams of 2. In every way, this game just works for me. Fans of Rivals or any of the DC Deck Building Games should love this. I highly recommend it. It’s a must have in my book. Now if you’ll excuse me, Lex Luthor and Ocean Master are trying to take over the world again. Up, Up and Away! This entry was posted in Reviews and tagged board, board games, building, card, card games, confrontations, cryptozoic, cryptozoic entertainment, dc, dc deck building game, deck, deck building, entertainment, games, hyra, matt, matt hyra, nathaniel, nathaniel yamaguchi, yamaguchi. Bookmark the permalink.